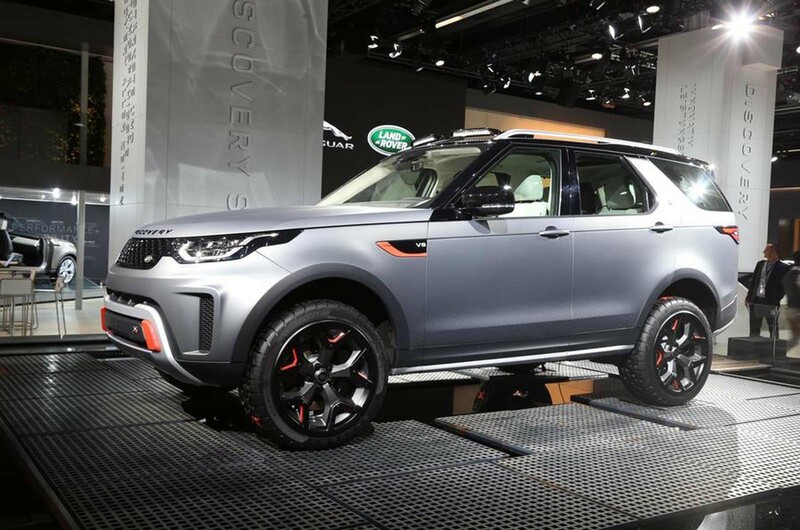 Design bosses at both Land Rover and Jaguar see merit in more models wearing the new SVX badge for extreme off-roaders, following last month's launch of the Discovery SVX. The SVX badge is the work of Jaguar Land Rover’s Special Vehicle Operations unit, which is designed to signify the most off-road-focused variants. Land Rover design boss Gerry McGovern has told Autocar that the new badge would be appropriate for Discovery models and “arguably Defender” when that launches later in the decade , but less so for a Range Rover. Jaguar design director Ian Callum, who gave the E-Pace SUV a public debut at the September show, has said the badge could be possible on a Jaguar too. McGovern revealed the plush premium execution of the Discovery SVX – what he described as “premium durability” – was a direction the Defender was likely to follow. He highlighted that materials can be both premium and durable, such as the satin paint finish, and while the SVX badge had moved the Discovery in a more extreme direction, it had also made it more premium. Am I the only one who thinks this is a load of bull....! But, but, but, it's got bits of orange on it. Isn't that cool? Nope, but it's premium bull. Or they could just concentrate their efforts on actually releasing the new Defender. You know, like years after they said they would. You do know that any new Defender from McGovern isn't going to be a direct replacement for the old one? It may look rugged, but I suspect that it may appeal more to a lifestyle market than farmers. These SVX models are going to be the best bet for an off-the-peg LR off-roader for a while yet. He says that people don't want a basic 4 x 4 anymore. They do, but not at JLR prices. The original Land Rover = Defender was born out of a UK government urge to export to chip away at war debt. The rest of the world can now buy basic go-anywhere vehicles from Asia. To me the obvious solution would be to work within Tata Motors to design the best basic 4 x 4. I get the impression this move is inspired by the Jeep Trailhawk sub brand. Pity that both these manufacturers have to do this rather than stick to a proper off roader. But if if gets sales what the hell. I don't think they've used the word premium enough in that advertorial. "Defender, when that launches later in the decade"
I don't see the problem. Clearly Land Rover don't want the next Defender to be just a utilitarian mud plugger. They want it to be the best off road vehicle in its class bar none, pioneering next off road tech and whilst also being refined enough to widen its appeal. Today that car is arguably the Toyota Land Cruiser. Why can't Land Rover take on Toyota? Why make a cheap as chips Jeep? Do you know how hard it is to make profits in that way? And what's written by with the next Defender being best of class? Sure you may not be able to afford it but Rover said nice tried to make affordable cars and look where it got them!